"Fragment of silk textile decorated with a Naskh script inscription of the Moslem credo: “There is no God but Allah and Muḥammad is His messenger”, repeated four times within wavy strips. The upper and lower parts bear the names of the four rightly-guided caliphs (Abu Bakr, ‘Umar, ‘Uthman and ‘Ali). 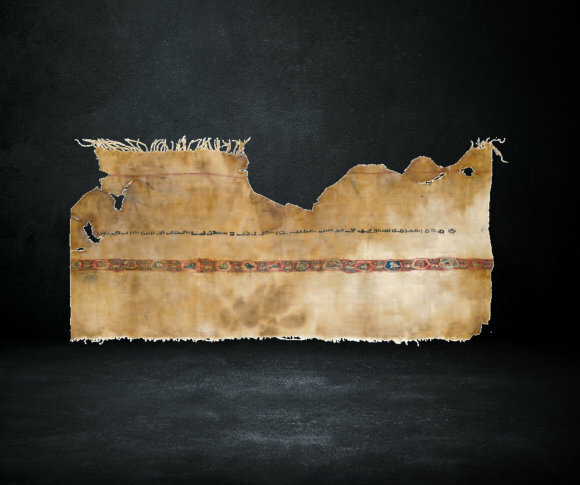 This textile fragment was either used as part of a cover of the grave of the prophet Muhammad (pbuh), or as part of the inner curtain of the holy Ka‘bah at Mecca. "This saddle is a living proof of the importance of compassion in Islam. In this vein, Islamic Art has produced numerous other artifacts designed to protect and take care of different animals. 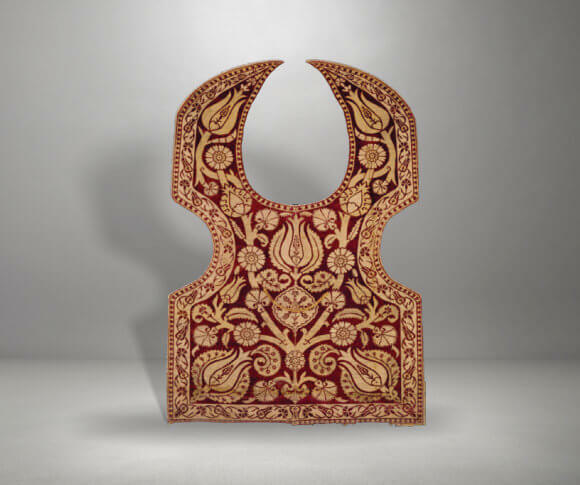 So, despite of its being a horse saddle made merely to cover a horse’s back, the artisan who made it toiled at decorating it with velvet, silk and silver threads. This demonstrates, beyond any doubt, the philosophy of beauty, mercy and compassion to living creatures of the Islamic Civilization. 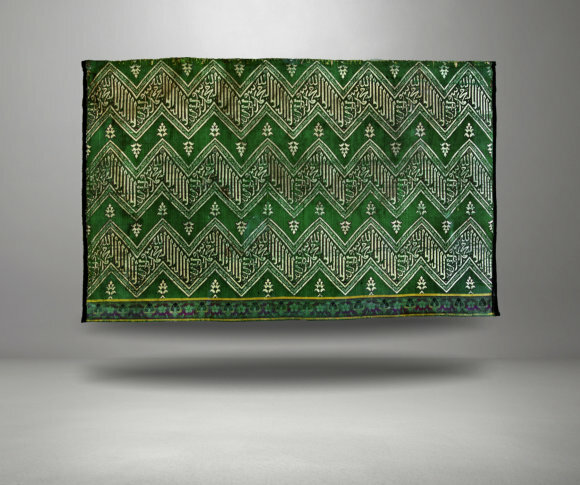 "This turban, belonging to Ṣāmuʾīl ibn Murqus, is among the master pieces of textile art in the world. Its importance stems from the fact that it bears the oldest extant writing in Kufic script on textile from the Islamic era. It reads: “This turban belongs to Ṣāmuʾīl ibn Murqus, made in the month of Rajab of the Muḥammadan calendar (Higra) in the year 88..(sic)”. Some scholars attribute this turban to the town of Sanhūr in the province of al-Fayyūm. "This carpet has a central medallion decorated with interlaced and interconnected vegetal motifs. Its background is also filled with interlaced vegetal designs, whereas the borders are decorated with Persian inscriptions in Nasta’līq script. The latter are adorned with medallions depicting mythical creatures. 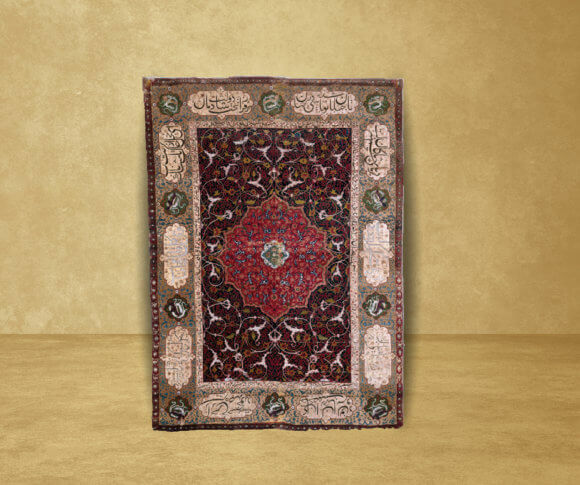 Most likely, this type of carpet was used for hanging on the walls of the royal palaces of the Safavid rulers of Iran, due to its extravagance, marvelous decorations and exceptional artistic value. 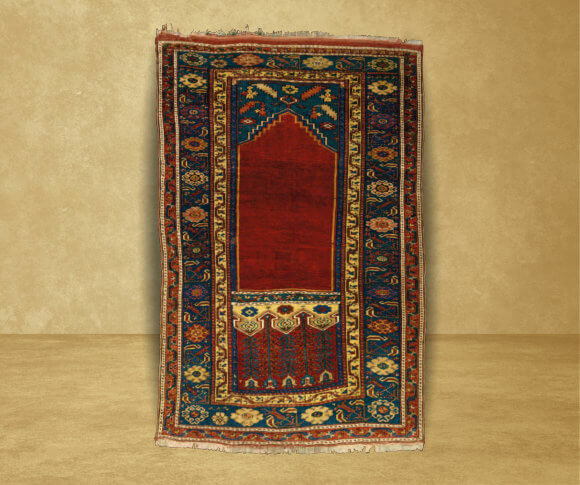 The central area of the prayer rug has a decorative element in the form of a mihrab surmounted by a crenelation as usual in the rugs manufactured in Ladik of Turkey. The frames are decorated with various foliate and geometric ornamentations.